This small museum is run by the Confraternity of the Most Holy Shroud, an order founded in 1598 to promote the devotion and worship of the shroud. It was absolutely grueling to get there, walking across Turin in a blazing heatwave and then having to wait till they finally re-opened the museum after their long afternoon break. It was incredibly hot and from the street, you couldn’t see the church (where the famous replica is kept) so we were never sure if we were in the right place. So, we waited drinking warm coke without ice in an airless cafe on the corner. When finally the doors creaked open, we found ourselves in was really the quirkiest museum I have ever been in–so quirky, in fact, that it immediately called to mind the Museum of Jurassic Technology in LA! I still can’t decide which is quirkier. The shroud itself is kept elsewhere and only on view once in a great while (we had missed the last showing by only a few weeks). Despite the fact that we were both enormously prone to disbelief–my astronomer, because he thinks of himself as a scientist; and me, because I am a devotee of Umberto Eco and have learned quite a lot about the ins and outs of the medieval relic trade… still, would you believe, I became incredibly moved and broke down and cried after I left the place? For me as a visitor of the shroud museum, it didn’t matter whether the shroud dated from the Christ’s death or whether it is a fabulous Medieval creation (which I think is the case based mainly on the carbon dating results, but I will never know, will I?) It simply didn’t matter because the museum was not there to persuade but rather existed to exhibit a centuries-old collection of artifacts related to the holy cloth that was brought from Chambery to Turin in 1578. 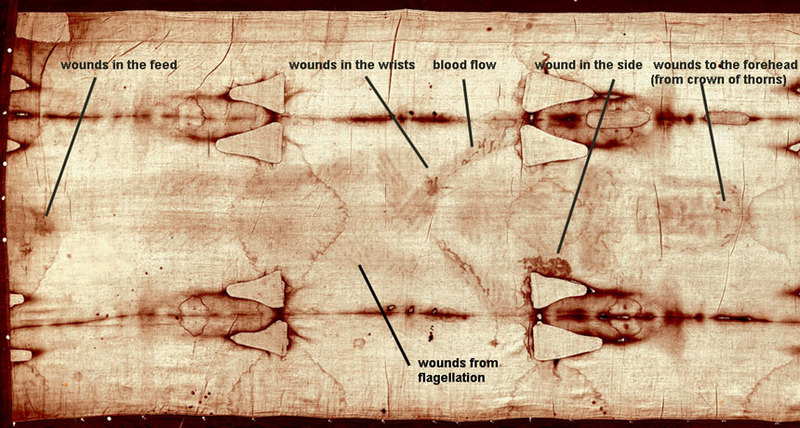 As I mentioned, in all the museum literature the image of the man seen in the shroud was always referred to as "the man of the shroud" and what one sees in graphic detail is the absolutely gruesome way this man died. Beaten to a pulp, he was then tortured to death–and it can all be "seen" in the relic. It’s all there, from the nail wounds, the blood from his head and swollen cheek to the horrible postmortem injury to the side. Every drop of blood in the fabric speaks of brutality. And walking through the exhibits, contemplating the final hours of a man who was brutally beaten, whipped and then crucified–made to die slowly (maybe in front of his mother) one simply could not help but draw to mind the tremendous suffering going on in the world today–things we know about but turn away from. If it didn’t happen to a man called Jesus of Nazareth, we know it happened to others since it was an ancient form of the death penalty practiced across the Roman empire, among other places. And this kind of cruelty continues today. Funny; a photo in the story is from the old SEAM museum in New Mexico. As an astronomer he should know that even the most elegant theory can be torn apart by a single perceptive observation. Simon Brown Video of Barrie Schwortz at Jalsa Salana UK Oy vey! We’ve got a problem?